Even if you have limited space in your vegetable garden, including a few flowers is a smart idea, and it is full of perks. Flowers quickly dress up a pedestrian vegetable patch. Flowers are used in companion planting to deter pests. Interplanting saves space and offers benefits for your vegetable plants, not the least of which is enticing more bees and pollinators into the vegetable garden. Many vegetables have flowers that are not showy enough to attract pollinators, even if they are high in nectar. Planting some bright flowers can fix that problem. Studies abound about which plants are good for repelling pests and which attract beneficial insects. There is a lot of disagreement on this point, and do not expect a few well-chosen plants to put an end to your garden problems. However, it is worth experimenting, and you may just gain an edge. If the flowers themselves are edible, then you get the best of both worlds. Even without companion benefits, the vegetable garden is a lovely place to plant flowers intended for cutting. You can snip them at the same time you are selecting vegetables for dinner. Take a look at a few choices that can add a new dimension to your vegetable garden. 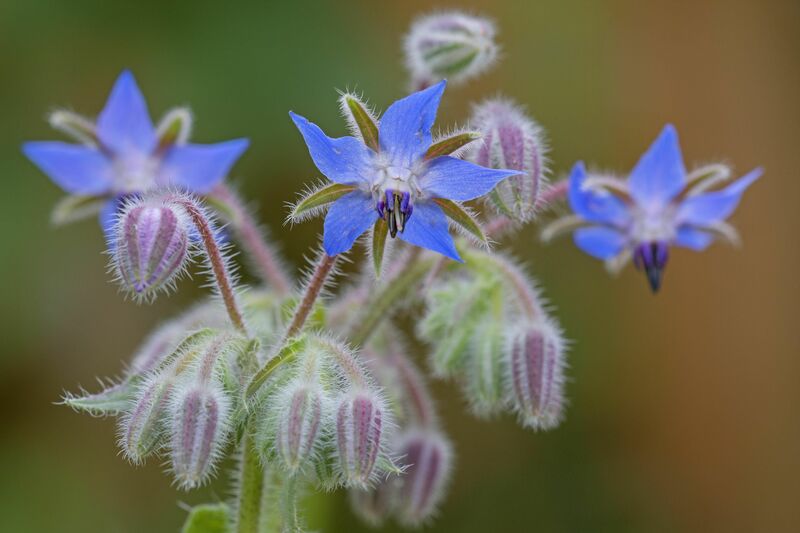 Borage grows into a wide, gangly plant that is lovely in a cottage garden but can be somewhat messy in more formal borders. However, it is an herb that is right at home in a vegetable garden. The flowers are a beacon for bees and a delight for gardeners. Both the leaves and the flowers are edible, with a subtle, cool cucumber flavor. The plants are fast growing and can be direct seeded. After that, they tend to reseed themselves, so you will have an ample supply. Some flowers are pink and some blue. That can be caused by light, temperature, and other external conditions. But one theory is that the color changes as the flowers age and lose their pollen. Presumably, the blue color tells pollinators that the flower is no longer worth their effort. Pulmonaria, which is in the same family, does the same thing. Calendula, or pot marigolds, are in the daisy family and are not related to the marigolds in the genus Tagetes. Pot marigolds are considered an edible flower, although they can have a predominately bitter flavor. It is their brilliant golden orange color that lights up dishes. In the garden, calendula is a mixed blessing. It repels some pests, such as asparagus beetles and tomato hornworm, but it also attracts a few others, such as aphids. Do not let that deter you. You can use the flower as a trap crop, putting it on the other side of the garden from plants that are often attacked by aphids, such as peas. Few flowers grow as easily and bloom as profusely as the annual cosmos. For the vegetable garden, choose the white or bright orange varieties, such as Cosmic Orange. They attract bees and maybe even better, green lacewings. These insects may look delicate, but they are voracious eaters, vacuuming up all manner of soft-bodied insects including aphids, scale, and thrips. Green lacewings are considered a beneficial insect, and making them at home in your garden will prevent pest insects from becoming a problem. You do not need to find an excuse to plant lavender anywhere, but that heavenly, much-loved fragrance is a repellent for several pests of the vegetable garden and the gardener. You probably know that deer avoid it, but there are other insects and animals that also steer clear. As a bonus to deterring deer, you will also see fewer ticks. Lavender will not ensure that you will not get bit, but it should cut down on the number of ticks in the area. Moths, like those pesky green cabbage moths, also find the scent offensive. Even mice will find somewhere else to snack. Marigolds do not get the respect they deserve. They deter pests both above the ground and below. Ring your garden with marigold plants, and rabbits will think twice before crossing the line. Confuse Mexican bean beetles by interplanting marigolds with your bean plants. Marigolds have also been credited with repelling squash bugs, thrips, tomato hornworms, and whiteflies. Some even exude a chemical that kills root nematodes in the soil. If nematodes are a problem, you will need to plant your marigolds a year in advance and leave the roots in the soil at the end of the season. Cheerful nasturtiums prefer cooler temperatures and continue blooming well into the fall. They are favored by aphids and make a great trap crop. But they are also one of the more delicious edible flowers (leaves too), so do not sacrifice them all. Nasturtiums also offer some protection from squash bugs and beetles. The seeds are large and easy to collect for replanting next season. Many varieties will probably seed on their own. Plant the seeds after scarifying them first (nicking them or rubbing with sandpaper) to help along their germination. Or perhaps you would like to try turning them into nasturtium capers. Old-fashioned scented sweet peas are not edible by humans (the seeds are poisonous), but many other creatures find them delicious. If you have difficulty keeping them around in your flower garden, growing them in the protected enclosure of your vegetable garden is an alternative. Vegetable gardens are good places to put all kinds of cut flowers because you do not have to worry about empty spaces looking unkempt. Growing sweet peas with tall edible peas and pole beans is a way to squeeze them into the garden and get the benefit of attracting more pollinators to your beans. They will not cross-pollinate with edible peas, as they belong to different genera. Nectar-rich zinnia flowers are magnets for bees and other pollinators. They are also listed as popular with hummingbirds. The paler, pastel varieties seem to be attractive to Japanese beetles and can be tried as a trap crop, although you may be hesitant, for good reason, to try anything that attracts Japanese beetles. As with sweet peas, planting zinnias in the vegetable garden gives you the opportunity to use them as cut flowers without leaving large gaps in your flower garden. Should You Start Your Vegetable Garden From Seeds or Seedlings? What Are the Best and Worst Companion Plants for Garlic?